Enjoying the beautiful weather, beer and Don's Birthday at Big River Brewing Works. One of my favorite places turned 55 today. Here are some of my memories from there. This was taken earlier this year when I went on vacation by myself. I had a great time. Don, Katharine and Gammy near Main Street. Katharine and Gammy on the People Mover. Don, Katharine and Jerry on the Matterhorn. Some of my best memories are at Disneyland. We used to go every couple of years when we would visit my grandmother in Arcadia. We would plan our days and have such fun. I can't imagine my life without my family and Disneyland. Mango daiquiri with wild berry flavors. Don had a Safari Amber Ale. Don waiting for the Magical Express bus to take us to the Magic Kingdom. 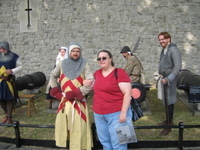 On my visit to London in July, I visited The Tower of London. One of my favorite parts is Traitor's Gate pictured below. The stairs on the left are where important prisoners would enter the Tower from the River Thames. 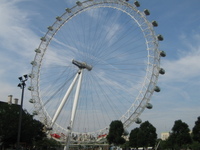 Saturday began with a flight on the London Eye. A 25-30 minute ride on a very large "ferris wheel". The flight was great and the view was magnificent. I had been told by many that it wasn't worth it, but I feel it is like the Space Needle in Seattle - you have to do it at least once. The capsules have room for quite a few people but the one I was in only had about 10. You get a spectacular view of Big Ben and Parliament and a decent view of Buckingham Palace. The Queen wasn't in though. After the flight I waited for a Thames Clipper to take me to the O2 for the Tutankhamen exhibit they have there. The boat ride was fun and I caught a little snooze since it took longer than I thought it would. Once at the O2, I grabbed a diet coke and a muffin since I hadn't eaten anything and didn't want to wait till I was done with the Tut exhibit. The exhibit itself doesn't allow any photography, but I have to say that I love Egyptian antiquities and they had some of the best. I remember the British Museum having a pretty good collection as well but I didn't make it there this time. On my way out of the O2 I stopped for lunch at a restaurant called Spur Steak & Grill. The decor was American Indian and I was looking for a burger with fries AND Coke products. I had a bacon cheeseburger with fries. I had forgotten that British bacon is much wider than American bacon so they only have to put 2 pieces to cover your whole burger instead of the 4-5 it takes in the States. The fries were pretty tasty as well and the diet coke bottomless. It was a win all around. I left the O2 and made my way to the nearest Tube station so I could get on with my day. 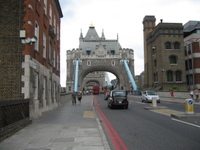 Next I decided to walk across the Tower Bridge on my way to the Tower of London. I love bridges (the kind you can't see through or swing on) and enjoyed the walk even though I was starting to feel a bit tired. The Tower of London was just as I remembered with the exception of the people dressed in period clothing acting out sieges using catapults and water balloons. I love the Crown Jewels - so sparkly. Of course you aren't allowed to take photos of them either. I kept thinking of Julie Anne and how she would be staring longingly at the crowns and wondering if she could slip one in her purse. I then returned to my hotel to rest my legs and feet and to check email and just hang for a bit. Later I decided to hit Piccadilly Circus. I was stunned by the number of people there. Probably one of the busiest places in the world. I walked around for an hour or so and then got "dinner" at one of the many McDonald's in the area. I wanted some fries for relatively cheap. I think the fries are better than the ones in the US - not as salty. Then I walked around a bit more before making my way back to the tube. I had to ask directions since I kept walking and would find myself in the same place. I was all turned around. The light are amazing. Finally got back to my room where I packed up everything I wasn't going to need overnight or for the morning and went to bed. Friday we went to the office, stopping on the way for an iced caramel latte and a delicious lemon-orange muffin. Once at the office, the group we were traveling with suggested that we could skip their meetings today since we had heard their presentation many times and we had our own that afternoon. We decided to take them up on it and went to the Ops section. I finally got to meet many of the people that I deal with over the phone or by IM every day. I spent a good portion of the morning responding to email and looking at tickets that my group was workin g on. The group took me and my co-worker to lunch at a local pub where most of us had fish and chips. I had forgotten how good English chips are. We returned to the office for some more email and troubleshooting and then went to the conference center to do our presentation. On the way down we saw a sign that said the monthly fire drill would be at 16:00 so I asked the ladies at the front desk if that meant we would have to leave the building and they said that we didn't need to leave but it would be quite loud for about 2 minutes. The presentation went well except for the fact that the conference call wasn't working and only 5 of the 16 people who said they were coming actually showed up. I can't really blame them - the meeting was set for 16:00 on a Friday. I don't believe there is a worse time for a meeting. After work we all went to another local pub. There were tons of people drinking on the sidewalk. I love the UK. 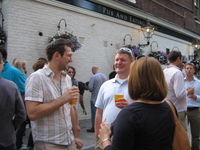 Where else can you get away with drinking in the street? We stayed for many hours and then finally went to dinner around 22:00. I got back to the hotel about midnight and spent some time on-line. Then I went to bed. Another wonderful breakfast at the hotel followed by some souvenir shopping. 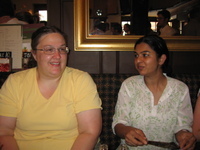 I then returned to the hotel to make sure I was all packed so we could meet our travel companions at the train station. The train ride to the airport was uneventful and the scenery was beautiful. At the airport we started at the British Airways check-in. It truly amazes me how people waiting in a queue are never prepared when they get to the front of the line. It took a bit of time, but finally bags checked and off to Passport Control and then security. Passport control had very long lines and then one of our party realized that there was a non-European line that had no one in it. So we made it through fairly quickly. Security was fairly speedy and then we went to the British Airways lounge. The people we are traveling with are flying business class so they have access to the lounge and they can take in a guest. The lounge has free drinks, alcoholic and non-alcoholic and a variety of snacks. It also has free internet but we only had about 30 minutes to wait so I didn't bother. Everyone else was in a frenzy to check work email but I figured why bother - most of it would require more response than the 30 minutes I had and I didn't want to be thinking about email for the whole flight. They announced our flight in the lounge and we made our way to the gate. The flight was pretty typical - about an hour and a half with beverage and cold lunch service. They offered chicken and cheese or cheese sandwiches. I had the chicken with cheese and a diet coke. It was decent for airline food. They also hand out entry cards for people that are not UK citizens that are landing in the UK and not flying on to another destination. The card asks for your name, address, phone number and your address while you are in the UK. 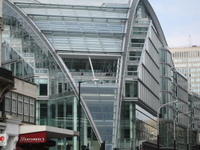 Once we landed, the 3 people we were traveling with hired a car to take them to the office and my co-worker and I go t on the Heathrow Express. This is a train that takes you from the airport to Paddington Station. The picture of me to the left is in Paddington Station. We caught the tube at Paddington to the Victoria station where we walked out of the tube station and looked like typical Americans with no clue where to go. We started walking and then ended up asking a policeman which way to go. Neither of us had thought to look up the specific directions from the tube station the hotel. £2 (approximately $4) from the mini-bar. I grabbed my purse and went walking to find the store and found one about 2 blocks away. On the way I had seen a Asian restaurant and decided I would go there for dinner after I had bought the DC. The restaurant is called dim t and they serve dim sum and a variety of Asian dishes. I had gyoza and Japanese fried rice which is basically chicken fried rice with teriyaki sauce. It was very good and I returned to my room with a 12-pack of DC and spent about 2 hours trying to figure out what I wanted to do on Saturday. Then I went to bed. The day began with breakfast in the hotel consisting of eggs, bacon, grapes and a croissant. Fresh-squeezed orange juice to drink - so yummy. Then a train ride to the office where we had a few meetings before lunch. Lunch was in the Cafe and I had spaghetti with meat sauce. It was really good. After lunch was my groups presentation. It went very well and we got some good feedback from the attendees. We ended up answering questions for about 15 minutes past the end time of the meeting and then we went back to the conference room that had been reserved as our space. Then the return train ride to the hotel. I decided I wanted to be alone for the evening so I went to the bar where I had a really good tequila sunrise. Then I went to dinner at one of the restaurants in the hotel called Pfiftermühle. I had a fillet of beef boiled in an herbal stock with a red wine sauce, marrow dumplings and leek and potato bacon cake. Very tasty. The beef was very tender and the sauce was delicious. I wasn't going to have any dessert, but when the server brought the menu I saw a dessert that had fresh berries that sounded delicious so I decided to go for it. 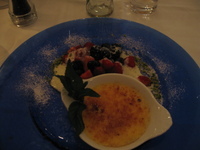 It turned out to be creme brulee with fresh raspberries, blackberries, strawberries and bluberries. It was the best creme brulee I have ever had. The images are a little dark but I tried with the flash and it looked worse. I had planned on walking around and looking in some of the souvenir shops, but they were closed and I was really tired so I returned to my room and went to bed. I have been severely chastised for not mentioning beverages. Most of us had beer. Yes, I had A beer. It was the house light and was acceptable for a beer. When in Germany... I might have had more, but I was feeling a bit headachy and tired. I didn't want to tempt fate and get a major headache while traveling. What a glorious day. Munich is a beautiful city with very friendly residents. I also believe there are more bicycles here than in any other city. They are parked everywhere and people whiz by you on them. I am staying at the Platzl Hotel and it's a wonderful hotel with great service. The room is comfortable and the view is charming. I can walk to many sites and restaurants and in the evening there is the sound of the city coming in my window. I never thought I would come here, but it has been a great experience and has reminded me how young my country is. The hotel serves breakfast every morning from 6:30am to 11:00am. We have gone every morning and the food is wonderful. They have a buffet that includes eggs, bacon, sausage, various fruits and cereals, various pastries and fresh squeezed juices. It is a great way to start the day. After breakfast, we took a cab to the office. We decided this was the best choice since neither of us knows the city and we aren't familiar with the train system. When we got to the office about 30 minutes later the taxi fare was 34 Euros. I was shocked - we decided we would definitely be taking the train back to the hotel an d to the office for the remainder of our stay. Our meetings were productive and I learned some things I didn't know that will help me with my own customers. Lunch was provided at the Cafe at the campus. I had pork with pasta. It was delicious. They have china and flatware and glasses for drinks. Very different from our paper and plastic in the US. When you have completed your meal you put your tray on a moving belt that Don would love to play with and watch going round and round. The train ride back to the hotel was fun because you can watch the people and the scenery. Both were entertaining. Once back at the hotel I rested for about 20 minutes and then went over to the hotel of the group we are travelling with to meet our hostess for a short walking tour of Munich before dinner. As we left their hotel we all mention the bucket of umbrellas, but of course none of us grabbed one. We walked all over the city with our hostess providing some basic history. 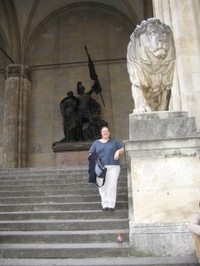 The picture to the left is me standing on the stairs of the Feldherrnhalle. As we finished up the tour and started to head to the restaurant, it started to rain. Not Seattle rain where you don't need an umbrella, but an honest to goodness downpour. We stepped into a little shopping area to wait it out and discussed how stupid it was that none of us had grabbed an umbrella. It finally slowed a bit and we went on to the restaurant. When we got there, most of us were soaked. 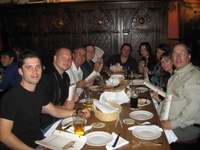 The restaurant, Andechser am Dom Wirsthaus, is a typical Bavarian style restaurant that is (or was) run by monks. The food was amazing. We started with an appetizer plate that had huge radishes cut in spirals, an amazi ng cheese mixed with spices, and 2 types of breads with toppings. The cheese was for spreading on pretzels. Which they serve all times of the day here. One of the breads had fried onions and the remaining grease from some cooking process. It sounds disgusting but it was pretty tasty. The other bread had chives and some sort of cheese spread - also delicious. All of these items are definitely not good for you. 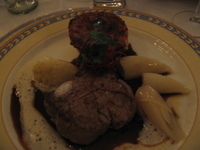 My main course was a steak with a traditional Bavarian sauce and fried onions on top. It was served with grilled potatoes with herbs. Sooo good. Then we had a dessert sampler that was to die for. It included streusel, chocolate cake, fried apples with cinnamon sugar, and a few other items that I can't remember. All were delicious. We then rolled back to our hotel and went to bed.